We all need a good way to lacerate our carbon based sustenance into small easily masticated bits. The Freescape Camp Kitchen Kit from Gerber comes in handy for just such an endeavor. 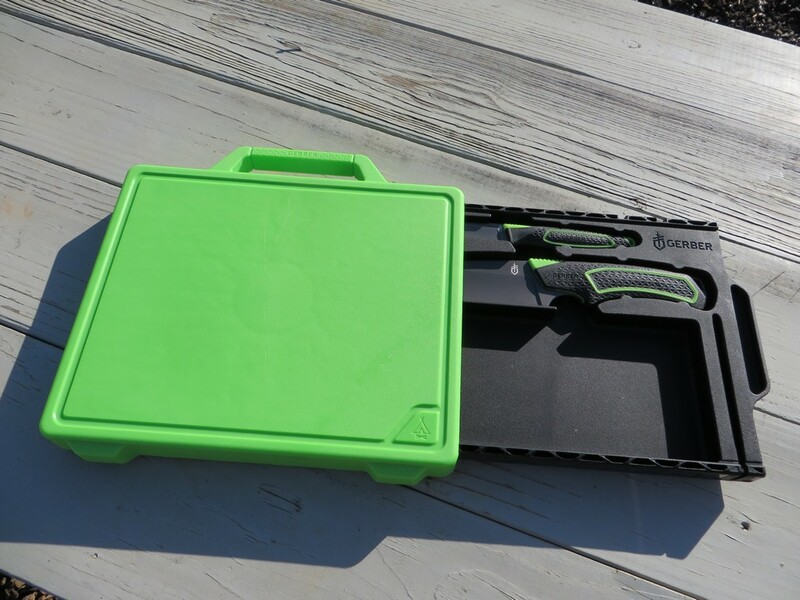 Combining a cutting board, kitchen knife, and pairing knife into a easy to carry kit, it’s pretty handy to have around while playing camp ninja. The Freescape is an overall convenient and clever design. The two blades lock securely into the internal drawer, packing away neatly and securely when not needed. 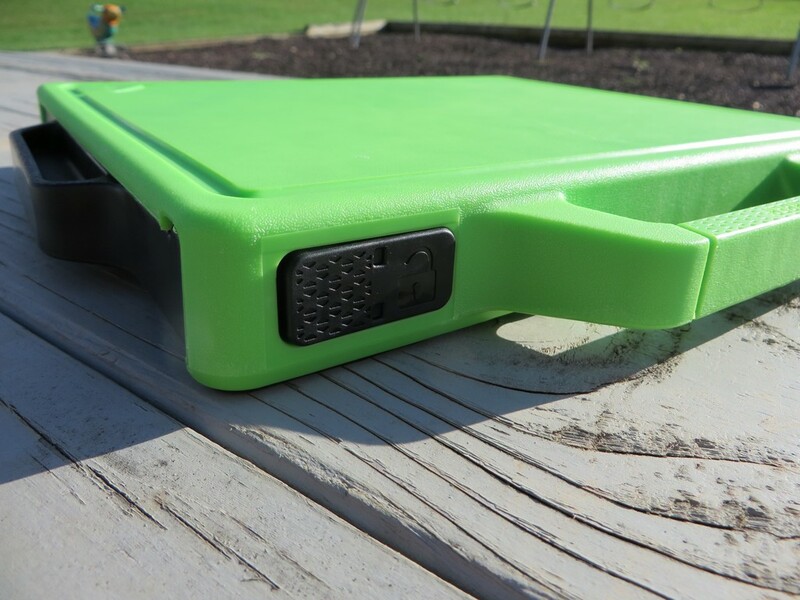 This hidden compartment locks in place under the built in cutting board, with a small button releasing the lock to slide it in and out. The kit also has a nice carry handle, and an extra storage compartment inside for other items like antibacterial wipes (great to have around while cooking). The whole set weighs about 32 oz, and retails for $88. The blades that are included are sturdy, and sharp. Both the kitchen and pairing knife have a very solid feeling to them thanks to the rubberized handle and a rigid steel blade. The kitchen knife feels especially tough, having no flex at all and real heft to it. The handles are exceptionally grippy, which is handy when working with wet items like freshly washed fruit or marinated meat. Slicing through fruits, veggies and meats was largely effortless, thanks to the very sharp blades out of the box blades. Having two sizes is a life (or maybe a finger) saver as there is always a good tool for the job. The large blade is great for chopping meat and carrots, while the smaller one is nice for detail work and peeling. Overall, the carry kit is built well. Solid sturdy plastic (polypropylene) makes for a good cutting surface. It doesn’t flex or give while pushing bearing down with the knife, and it does a solid job of resisting scarring from the blades. Once locked, the kit stays together without the blades falling out or the drawer coming undone. It’s light weight and extremely to have around, around camp or in the home. 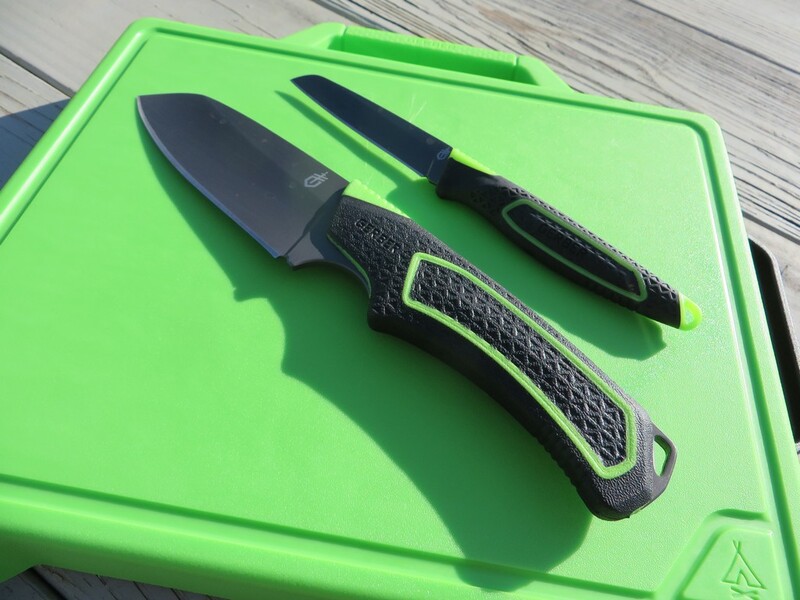 The blades are a little tough to get out of their notches inside the carry compartment. It takes a fair amount of force to get them out. The locking drawer is also a bit tricky, requiring some finesse to be able to easily slide it out. If the drawer is Thankfully, both of these translates into the fact that they never come loose, which is probably more important. The Freescape Camp Kitchen Kit is a nice, all in one travel companion for those who spend a lot of time at camp or grilling out. The blades are sharp and feel great to use, while the cutting board provides a nice durable cutting surface. The addition of the built in carrying handle paired with the intrinsically light weight makes it convenient and easy to tote along. I want to extend a big thanks to Gerber for their support and for providing us this great mattress for review. Our full disclosure can be found here. Thanks for reading! If you have any questions, comment below, send us an email, or find us on Twitter or Facebook (links on the right or below).